I basted a quilt yesterday, which I am reminded of today every time I move. I must have really worked those glutes. No wonder, really, as I'm sure I busted some yoga moves in the process. Now, I don't know from yoga, except that all the cool people do it and I've always wished I were cool. But I've watched enough early morning PBS to know that at one point in the process, I had to be doing something like a modified "Downward Dog." Also a lot of "Cat and Cow." For me, mostly Cow. This often morphed into "Extended Puppy," because who wants to have to get up and down all over again to close that one far away pin? "Frog" pose works for those hard-to-reach places too, if your knees can handle it. Mine, not so much. At some point, I accidentally jammed my left index finger into the sharp end of a basting pin, and all my form went out the window and I moved really, really fast! Because of the unexpected pain, of course, but also so as not to bleed on the quilt. I don't know the name of that move. Maybe "Surprised Squirrel"? I made up a few more unconventional poses, such as the one you do with legs about shoulder width apart, knees slightly flexed, and bent way over from the waist with your arms straight down. 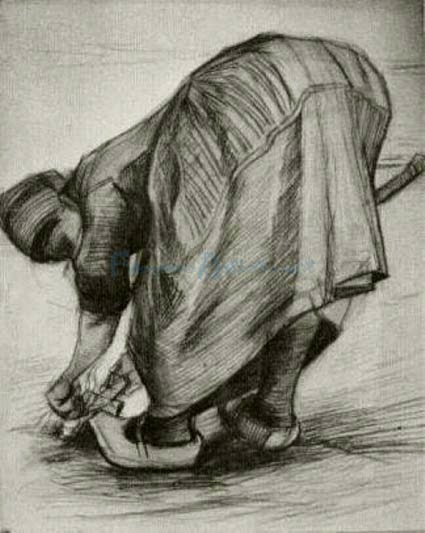 I call it "Woman Pulling Radishes," or "Gardener's Fanny." Yeah, that one really feels good. Might want to lay off the cruciferous vegetables beforehand if there's anybody likely to share your air space. I'm just sayin'. Of course, the bigger the quilt, the higher the likelihood of becoming fatigued. It's important to pace yourself and know your limits. You want to avoid the pose that involves you side-lying on the floor, having lost all feeling in your lower extremities. That one's called "911" or, alternatively, "Strife Alert." As far as this quilt goes, though, the best pose will hopefully be demonstrated by little Max when he finally gets it: "Happy Baby"! Oh my gosh, P., you had me rolling in the aisles with this one - especially when I reached the "Surprised Squirrel" move! Thank you for a very entertaining description of your basting process! You have a great gift of description and humor! Thanks so much! 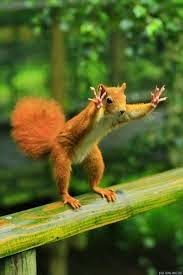 Oh My gawd...Im still laughing at surprised squirrel. This post totally cracked me up! Love your entertaining post, especially the surprised squirrel and "Woman Pulling Radishes"! I see we have quilting in common! Hope you'll check my blog at musingwithmytea.blogspot.com, too. Another one I read but didn't comment on. I laughed at this one a lot! You have an awesome sense of humor. Oh my gosh you are so funny! Paulette, I know this is an older post, but I found it quite by accident. You just made my day and I have to send this to my daughter Alina so she can have a really good laugh too! (She does yoga) My favorite position was Surprised Squirrel. I said it once before, but you are the Erma Bombeck of the quilter's blogland!